KATY, TX (KTRK) -- Have you ever seen a cloud like this? It's a rare "canal cloud" captured on video over Katy Sunday morning by ABC13 viewer Renee Newsom. So what exactly causes this long, feathery cloud to form? An airplane! When a plane flies through a layer of altocumulus clouds, it can trigger a reaction that converts super-cooled water droplets into ice crystals. The ice crystals fan outward in feathery wisps, almost like the wake of a boat in water. Eventually the ice crystals fall thru the sky, melt, and evaporate before reaching the ground, leaving behind what looks like a long canal cut out of the clouds. 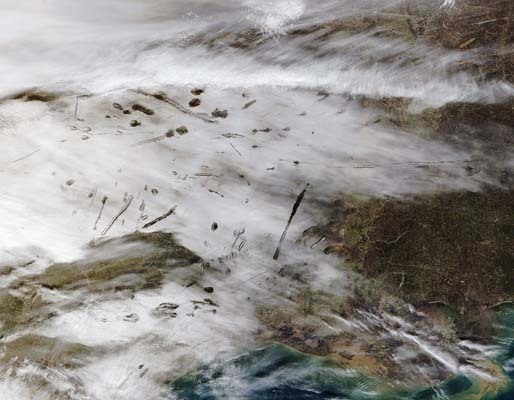 Numerous canal clouds over Texas and Louisiana were captured by a NASA satellite on January 29, 2007. You can see the long streaks left behind by air traffic, as well as "hole punch" clouds created by planes that ascended to higher altitudes.